The University Center Gallery hosts art exhibits by students and faculty throughout the school year, like the current exhibit “Transmission Park” by Master of Fine Arts student Jesse Blumenthal. 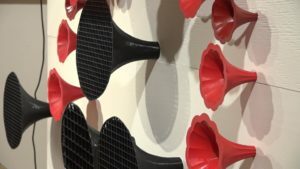 Reporter Wayne Stevenson spoke with Blumenthal about this exhibit, which combines visuals and sound to make a piece that he says relates to how our culture interacts with technology. For a schedule of UC Gallery exhibits, visit https://www.umt.edu/uc/uc-gallery/exhibit-schedule/.